Your Optometrist in Hamilton, Stoney Creek, Ancaster, Dundas, Flamborough, Glanbrook, Grimsby, Caledonia and Binbrook. Dr. Aman Dhaliwal & Associates team strive to provide the finest in optometry services. We invite you to browse our website to learn more about optometry services and invite you to join our patient family by scheduling an eye exam appointment at our Hamilton office. We are a full service eye and vision care provider and will take both eye emergencies as well as scheduled appointments. Patients throughout the Hamilton area come to Dr. Aman Dhaliwal & Associates because they know they will receive the personal attention and professional care that is our foundation. Our optometrists are dedicated to keeping our patients comfortable and well-informed at all times. We will explain every exam and procedure and answer all of our patient’s questions. At Dr. Aman Dhaliwal & Associates, we offer vision financing options and will work with vision insurance providers to ensure good eye health and vision care for all of our patients. 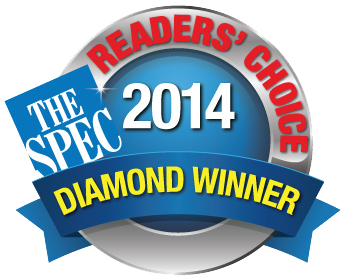 Dr. Dhaliwal & Associates is honoured to receive the Hamilton Spectator Readers Choice Diamond Award for best Optometrist for 3 years in a row 2013, 2014 & 2015. Our office offers quality professional eye care, including comprehensive eye exams in a private setting. Whether, you need to see an optometrist for your eye exam, to help with dry eyes, or to find the best eyeglasses and contact lenses, Dr. Aman Dhaliwal & Associates can help. The health of your eyes is important. The first step to take towards excellent eye health is to find a professional optometrist who cares. Dr. Dhaliwal and his staff care about your health and wellbeing, offering the best eye care services. We welcome all patients, from little ones to seniors. Our office features equipment, technology and techniques to diagnose and maintain your optical health care needs. No matter what your eyes require, we are there to help ensure you are healthy and seeing clearly.